The human endometrium is a very dynamic tissue undergoing an extraordinary growth during pregnancy and, in a cyclic manner, during the reproductive life of each woman. Endometrial stem cells (ESCs), undifferentiated auto-renewable cells able to generate daughter cells showing a higher level of differentiation, play a fundamental role in endometrial regeneration and repair. Therefore, they have a great therapeutic potential in many diseases and research fields. However, recent data suggest that an irregular function of ESCs can contribute to the pathogenesis of endometriosis and other disorders. In addition, ESCs have also been found in human leiomyomas and malignant tumours, and could be involved in their development. In this review we analyze the enormous regenerative potential of endometrium, which is, unfortunately, not exempted from its negative effects. This coexists with the good one as two faces of the same coin and constitutes the risk behind the fundamental protective and regenerative mechanisms to defend reproduction, and therefore the miracle of life itself. 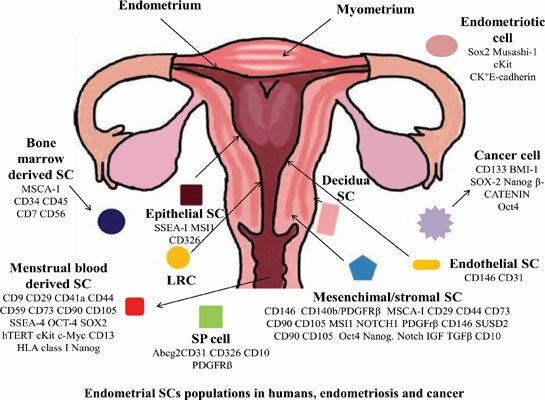 Endometrial cancer, endometrial stem cells, endometriosis, endometrium, leiomyomas, menstrual blood-derived stem cells, regenerative medicine, tissue engineering.